The VDP (Verband Deutscher Prädikatsweingüter), the elite association of German predicate wine producers, celebrated its 100th Birthday in 2010. A group of 200 German producers that have set highest standards for quality and ecology. Their logo is the grape eagle on the label or capsule, which is a guarantee for estate bottled wines, from grapes grown in their own vineyards under complete supervision. The best vineyards of the VDP members are classified as 1.Lage (first site) and wines can be labelled with this specific logo, if the quality is superior to normal stipulations. 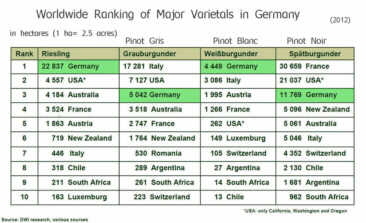 The VDP benchmark for quality is also followed by many non-member wine estates.